Greek Finance Minister Evangelos Venizelos said Greece is 7 billion euros short of a targeted debt cut of 107 billion euros after a successful bond swap with private investors. NEW YORK (CNNMoney) -- Greece announced Friday that its private-sector creditors will take part in a historic restructuring of the government's debt, setting the stage for the nation to secure more bail-out money and skirt a messy default. Investors agreed to restructure €172 billion worth of Greek bonds, which represents 85.5% of the total €206 billion held by the private sector, according to the Greek finance ministry. Another 69% of investors who own Greek bonds not issued under Greek law agreed to restructure roughly €20 billion. Greek Finance Minister Evangelos Venizelos welcomed the agreement, saying the restructuring will help Greece get out of debt and revive its ailing economy. "We can say now that instead of what usually occurred, we are today reducing the debt," Venizelos said at a press conference in Athens. "We are removing a large burden off the backs of the Greek people ... something which we owe to the next generations." The high number of volunteers enabled Greece to activate so-called collective action clauses, according to Jean-Claude Juncker, who heads the Eurogroup of euro-area finance ministers. The clauses, which the government retroactively added to its bond contracts a few weeks ago, give Greece the power to make the terms binding for all holders of Greek bonds issued under domestic law. Activating the clauses brings the total participation rate to more than 90%, the threshold Greece needs to cross in order to meet all the conditions of its second €130 billion bailout from the European Union and International Monetary Fund. Euro-area finance ministers held a conference call Friday ahead of a meeting in Brussels on Monday, when they could finalize Greece's bailout. In a statement, Juncker said, "The necessary conditions are in place" to authorize the release of loans from the euro-area bailout fund. He added that the Eurogroup looks forward to a "significant contribution" from the IMF. The IMF is expected to decide on its share of the bailout next week. On Friday, IMF director Christine Lagarde said she plans to recommend that the fund's executive board authorize €28 billion over the next four years under its support facility for Greece. "The scale and length of the fund's support is a reflection of our determination to remain engaged," she said. Under the terms of the restructuring, bondholders stand to lose up to 75% of their investment by writing down the value of Greek bonds by 53.3% and exchanging the debt for securities with a lower interest rate. The deal is expected to eliminate over €100 billion from Greece's debt load and reduce its funding costs over the next few years, according to the Institute of International Finance, which represents the private sector. "The debt exchange represents the largest ever sovereign debt restructuring," said IIF managing director Charles Dallara, in a statement. "It reduces the risks of contagion in the markets, while it enables Greece to build on the strengths of the reform efforts themselves." Following similar moves by other ratings agencies, Fitch downgraded Greece's credit rating to "restricted default" Friday, saying it will reinstate the nation's credit rating once it has issued new debt securities to investors. Separately, the International Swaps and Derivatives Association said activating the collective action clauses constitutes "credit event" under its guidelines. The widely expected ruling means that credit default swaps, derivative contracts that investors use to insure against default, will be triggered on some Greek bonds. However, the market for CDS contracts on Greek bonds is relatively small, valued at $3.2 billion, and analysts do not expect the ruling to be disruptive to financial markets. The ISDA said it will hold an auction March 19 to establish the "recovery value" of Greek debt, which will determine the net payouts made under CDS contracts. ISDA chief executive Robert Pickel told reporters in a conference call that the final CDS payout will be "much smaller" than the net $3.2 billion exposure. "We do not foresee a big impact from the Greek credit event on financial markets," he said. U.S. stocks edged off earlier highs immediately following the news. Greece also extended the deadline for investors who own government bonds that are not subject to Greek laws to participate in the restructuring to March 23. A small portion of Greek government bonds are governed by foreign laws, mainly British, and are therefore not impacted by the collective action clauses. 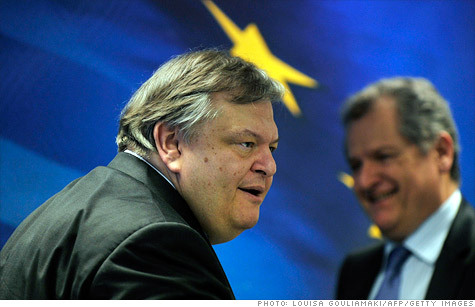 In an apparent effort to persuade remaining holders of non-Greek law bonds to agree, Venizelos said the terms of the restructuring will be significantly less favorable once the extended deadline expires. The nation at the center of Europe's debt crisis, Greece has been struggling with an unsustainable level of debt and an economy that has been in recession for years. Under its second bailout program, Greece has agreed to implement a series of austerity measures and undertake broader reforms to make its economy more competitive. The goal is to cut its debt to 120% of economic activity by 2020. But many economists say even that level would still be a heavy burden to bear and that Greece may need additional support to avoid default. Greece's so-called official sector creditors, such as the European Central Bank, own billions of euros worth of bonds that were not subject to the terms of the restructuring announced Friday.